Has anyone been able to dim their aftermarket illuminated switches using the factory rheostat? Yes, all you need to do is pull the lamp voltage off the factory harness. The trick though, if I remember correctly, is that the factory harness dims the negative side of the circuit as opposed to the positive side like you'd expect. This means you need to run wire to both sides of the switch as opposed to just using a single positive wire and grounding to the chassis normally. Last edited by Ludedude; 11-25-2012 at 11:53 AM. I had the same situation this weekend. I found if you tap off the factory wire from the dimmer switch (positive to positive input on switch) and switch negative to chassis ground. What I discovered is the aftermarket switch would dim, but opposite of the factory lights. Meaning, when the factory light is the brightest, the aftermarket switch lights are off. When the dimmer is rotated the opposite way the factory lights are dim or off and the aftermarket switch light is bright. But there is a happy medium, I don't run with the dimmer in either extreme. I adjust the dimmer switch in the middle and all the lights are dimmed appropriately. FYI, my switches run dim/bright with the dash lights, no goofiness about reversing the dimmer position. You just need to wire the lamp circuits on the aftermarket switches properly. Ludedude said, "The trick though, if I remember correctly, is that the factory harness dims the negative side of the circuit as opposed to the positive side like you'd expect. This means you need to run wire to both sides of the switch as opposed to just using a single positive wire and grounding to the chassis normally." and I'm using some SPDT and SPST switches w/double LEDs. A bit of head scratching. but making progress. Last edited by loose_electron; 11-26-2012 at 02:50 AM. Thanks Ludedude. I'll try those out and report back which wire they go to. Loose_electron, I have a SPDT mixed in with my SPST. One thing that confused me was the differences in the top light (accessory on) circuit. On the SPDT you have to run the upper light negative to the accessory negative (the lead running to whatever you are powering). That way it comes on when the switch is in both upper and lower on positions. Hope that helps a little bit. Alright, the yellow and red wire is positive. Thanks ludedude! I have been trying to get that working for a year. I just installed a couple of the OTRATTW switches to power some auxiliary lights. Everything is wired up and it working great. I used Ludedude's suggestion and tapped the two wires on the factory dimmer and ran those to the positive and negative for the lower LED. The new switches are dimming as they should. However, the lower LED is always on. I was thinking this would have the LED on only when the headlights are on. Do I have something wired wrong, or is this how your switches work as well? Last edited by ARK_SWAMP_RIDER; 02-19-2013 at 07:44 PM. Dude you just blew my mind, lol. SO one is power (yellow/red) and the other (green/white) has power too, bu the green white is neg dimming power? I tried to tie into the dimmer control for added foot lighting and got the same results as loose_electron reverse polarity, where the dimmer goes off when the rheostats/dimmer control is at it's brightest and viseaversa. I do have mine ground to a ground. Maybe that's the problem and it should be grounded to the green/white wire? Any one? I actually ended up using the DAC wiring to tap into illumination for foot well lighting. Was hoping to have the rheostat dimmer feature and since the DAC has a wire connecting to the dimmer but receiving a reverse polarity again. Wire diagram for the DAC is below. INitially taped in to the #2 and received dimmer but reverse when grounded to #4. Currently I am tapped into #1 for power and #4 for ground. I think if I put my ground wire on # 2 I would receive the correct dimming since it is reverse or grounded dimmer? Seems odd though and I want confirmation before I blow a fuse or led lol. LED lights will probably not work as expected, since they require a lot less power to light up (and not all LEDs are meant to be dimmed). Andries, originally I received dimming quality but in reverse of the dimmer control! SO when I turned up the brightest on the dimmer everything got bright and the foot lighting went dimmer to out all the way at full brightest. When I I turned the dimmer lower to off the foot lighting gradually got brighter until it was full bright when the dimmer control was off. I am going to try another configuration and report back with my findings. You can measure the voltage on both sides of your feed. Ludedude called it that it dims by raising the negative side of the bulbs, don't have a diagram in front of me. Basically the easiest will be to feed both sides of the extra bulbs from the existing OEM wires, not just one side, like ARK_SWAMP did. I just mentioned that a lot of LED lights may not work in the desired way as they were not designed to be dimmed, and definitely not with the OEM dimming circuit. 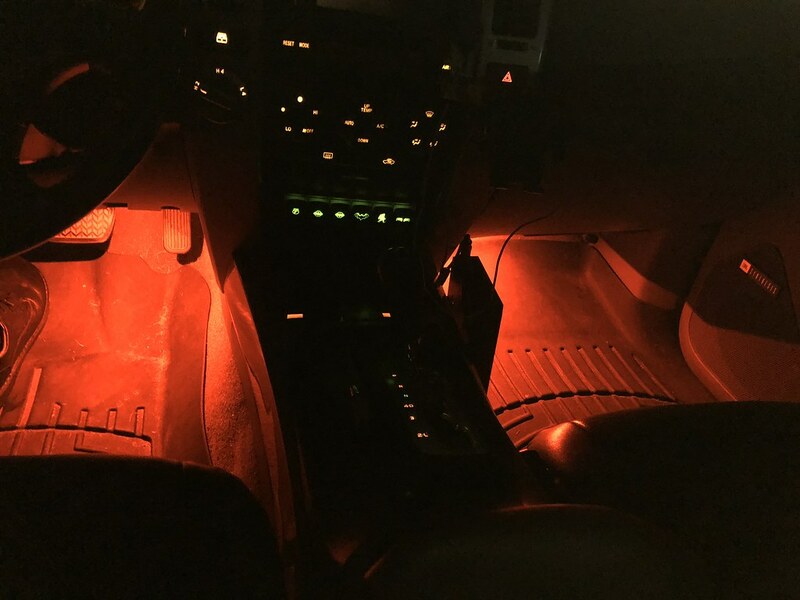 So if anyone wants to know you can tie into the DAC or the extra white clip harness in the center console for illuminating another switch or in my case very low wattage foot lighting. I am using 2 Small 1 smd LED that are 1 watt each in red. I’ll post some pics soon.